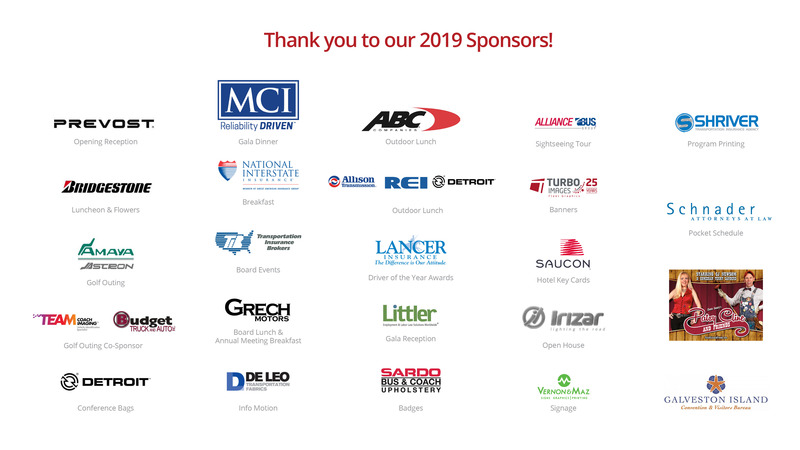 Welcome to the 2020 Trailways Annual Meeting website where Operator-Members and Exhibitors will find all that is needed to plan your travel, register and reserve your hotel room! We look forward to seeing you in Central Florida next March 1-4, 2020. On Sunday, March 1, the Executive Committee meets (a.m.) followed by the Board-only lunch, meeting & dinner (12:30p.m. – 9:00p.m.) There are no other general member events. On Monday, March 2, the Outdoor Activities take place (pending & optional). Tuesday, March 3, features the Opening General Breakfast & Sessions; Outdoor Lunch with Buses & Equipment; afternoon InfoMotion and evening Opening Reception. Wednesday, March 4, includes the General Breakfast, Annual Member Meeting with Roll Call; Spirit Awards Luncheon; Afternoon Indoor Exhibitor Tradeshow; Closing Dinner Gala with Safety Awards and Driver of the Year Awards. The Trailways Annual Meeting is the major international meeting of the owners of Trailways bus and coach transportation companies located throughout the U.S. and parts of Canada and Europe. Looking ahead to 2020, the 84rd Annual Trailways Meeting takes place in Orlando, Florida. This is the first time Trailways will meet in Orlando. Save the dates: March 1-4, 2019. The host Hotel is the beautiful Marriott Renaissance Sea World in Orlando, Florida. The Renaissance Orlando at SeaWorld® has a central location, full amenities and sophisticated event venues. The spacious guest rooms are some of the largest in Orlando. The resort features swimming pools, an on-site water park, complete with water slides, toddler play area and more, so bring the family! The resort also features multiple restaurants and Toppers Creamery®, a full-service spa, and more than 200,000 square feet of indoor and outdoor meeting spaces. We look forward to welcoming you to Orlando in 2020! To view the initial conference schedule, please see the snap shot at left. If you seek to reach the key decision makers at these exclusive Trailways ground transportation companies, this is your prime opportunity! Trailways companies account for more than $300 million in charter, ticket and tour sales annually. Bus suppliers, manufacturers and travel companies, upon invitation, may attend and exhibit at the Tabletop Tradeshow. (Your company must join or renew your Affiliated Partner or Preferred Partner membership with Trailways. Please contact us for details. Space is limited.) Many event sponsorship opportunities are available at the meeting. Business Development Office – Trailways Transportation System, Inc.